Guwahati, Jun 6 : Ngamrothang Hmar of Congress was elected the chairman of the 11th North Cachar Hills Autonomous Council (NCHAC) unopposed on Wednesday. 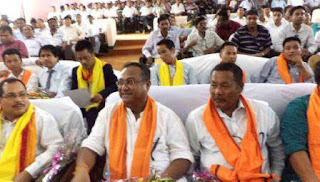 Returning officer Barun Bhuyan declared Hmar the chairman after no other nomination was filed for the post. Ngamrothang, a non-Dimasa tribal leader of DimaHasao district, is also the secretary of the district Youth Congress. Meanwhile, KulendraDaolagupu, a Congress member, proposed that election for the post of the chief executive member (CEM) of the council be held on June 13. The proposal was sent to Assam governor JB Patnaik for consideration and will only be held after the governor gives his nod.